When I was a kid we always used to play paper football using a folded up square of paper and hands as goal posts. In the spirit of the upcoming Super Bowl, I thought it would be fine to DIY a lightly more sophisticated version for kiddos (or football-loving adults!). This craft only a few minutes to make out of materials you have lying around the house. 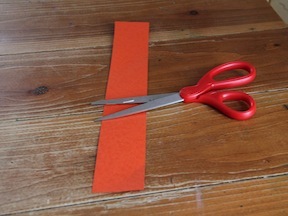 Step 1: Cut a strip of paper. The longer and wider the piece of paper, the bigger your "football" will be. Step 2: Fold your strip of paper over in the middle to make an "L" shape; this will start the triangle shape to make your "football." Step 3: Continue to fold the opposite ends of the piece of paper over the triangle in the center triangle over and over until you have a solid triangle. 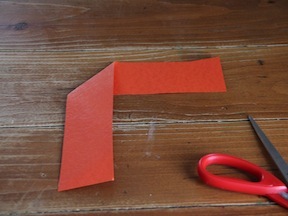 If it doesn't come out exactly right, you can just trim off the excess paper with the scissors. 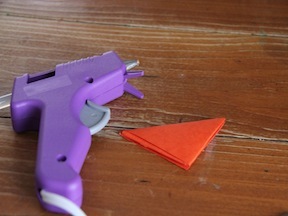 If you want, you can use tape or the hot glue gun to secure the paper football to itself. 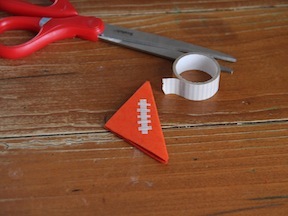 Step 4 (optional): Using a little bit of tape, create the threads on the football (optional, but so much fun!). Alternately, you can draw the stitches on with a marker. 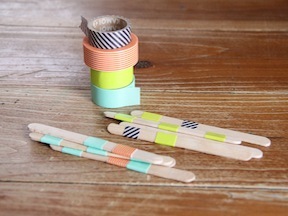 Step 5 (optional): Decorate your popsicle sticks to your liking—this is a great way to get the kiddos involved. 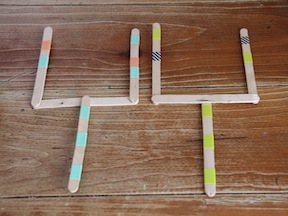 I used my patterned tapes to make striped popsicle sticks. Alternately, you can use markers to draw on them, decorate with glitter, or add fun rhinestone; let the kids use their imaginations! Step 6: Now layout your popsicle sticks in the shape of goal posts! For each goal post, use four popsicles and lay them out like this: make a capital "T" shape using two popsicles, then add the remaining two popsicles vertically attached at the end of the horizontal popsicle, as pictured below. Glue the pieces together. Repeat to make the second goal post. Step 7: Allow the glue to dry completely and you're ready to play!